Our latest project is none other than James Earl Jones. Born Todd Jones, he took theater to master his own stutter, and his since become one of the most commanding voices in film. He’s had roles in numerous films and other projects. His first film appearance was in Dr. Strangelove, seen at the end on the plane. Other memorable roles include his portrayal of Admiral Greer in the Tom Clancy movies, the voice of Mufasa in The Lion King, as well as the voice of some guy named Vader those Star Wars flicks. Mr. Jones also has in interview in Star Wars Insider magazine #49. Mr. Jones is very good about signing for his fans. If you send him a photo, card, or other item, he seems more than happy to sign, and personalize if requested. As always, be reasonable in your requests. He sometimes provides photos, but I would recommend sending at least an index card and or trading card. 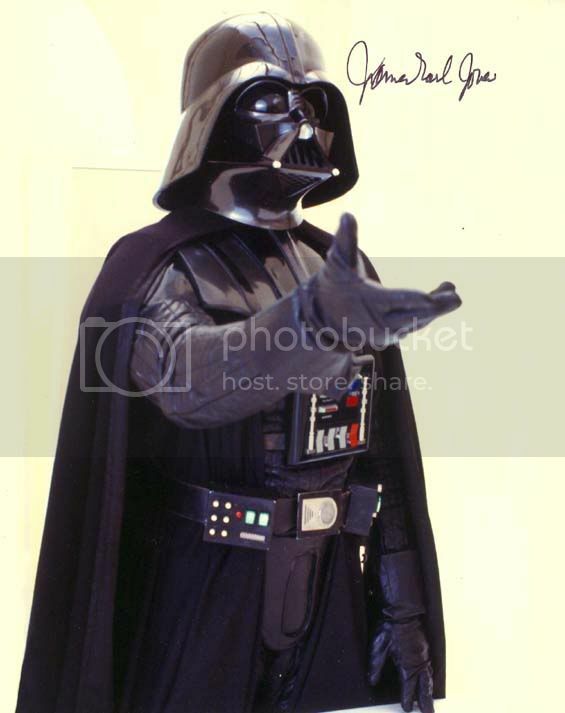 If you are interested in an 8X10 Vader, I suggest sending your own. Mr. Jones signs regularly, so you could expect results in about month, rarely more than two months. Don’t forget to log when you sent your request. Post it here if you like. But, that's what the IMDB link is for...a complete listing of EVERYTHING! Everything! Muahahaha! 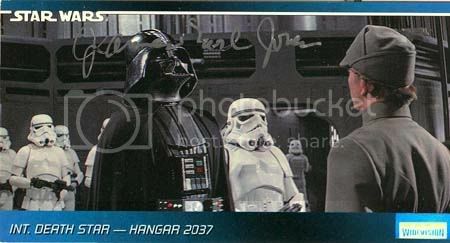 Got a response from James Earl Jones today. He personalized my index card and signed my two trading cards. That was a pretty quick turnaround....13 days. He didn't send his own photo, but that's fine with me. Check out the pic. Send out my little request 2 days ago, I'm eagerly awaiting it's return! I will probably be sending him a letter soon. I'm waiting for some Rots Widevison cards to come in the mail so I can send those to him. I thought that is what you might be needing those for. My Widevision cards arrived yesterday so I put them in my James Earl Jones envelope and it's sitting in the mailbox right now waiting to be picked up. Very nice Ryan....wonder if he'd sign figures? Images added to the first post for anyone wishing to use them. I'm not sure. Most people that have sent figures don't get them back.